Look dazzling for your hen party, with this feminine hen party sash. The personalisation sits on a ribbon banner, which makes the hen's name salient. With a gorgeous star design on either end of the sash, the design is symmetrical. You can also add personalisation to the back of the sash, for an additional charge. 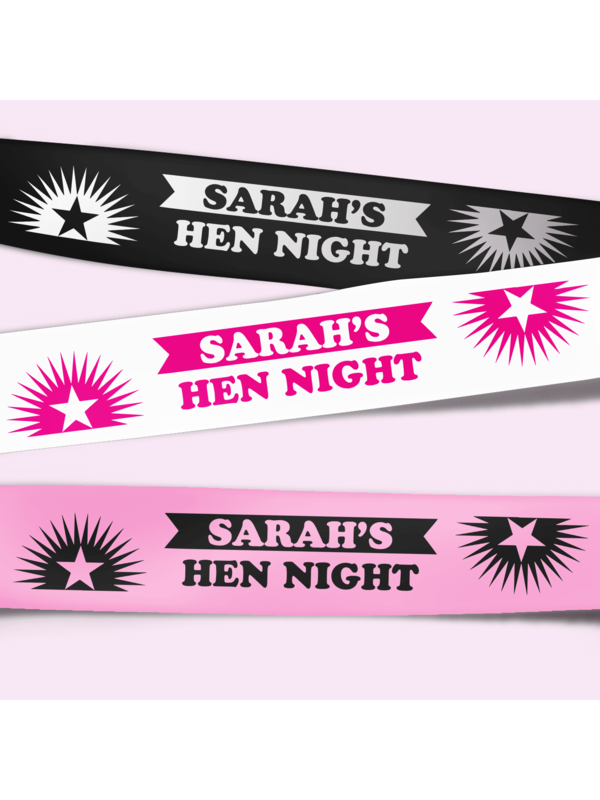 Showing our 2 Hen Party Superstore Star Personalised Hen Night Sash reviews with an average rating of Excellent. Would you like to write a review? Review Title - Love these! Review - The ordering was quick and easy, but would have liked a confirmation of the personalisation before payment, as I ordered 8 of these, all with different names, and couldn't go back to check I had done one for everyone, and not missed or duplicated any! That said, they are great and will tie the group together, as we are not dressing up, being slightly older hens!! Looking forward to the weekend! The ordering was quick and easy, but would have liked a confirmation of the personalisation before payment, as I ordered 8 of these, all with different names, and couldn't go back to check I had done one for everyone, and not missed or duplicated any! That said, they are great and will tie the group together, as we are not dressing up, being slightly older hens! !